The recent highly-acclaimed and much-nominated film The Imitation Game has bought Alan Turing back into the public consciousness. Coincidentally Turing was eclipsed in the awards stakes by another scientist (Stephen Hawking). Both men, you could say, excelled in difficult subjects, that are hard to explain to the layperson, not helped by their complicated personal lives and stereotypical awkward tortured genius. Aside from the relative merits of the films, I suggest that Turing’s legacy today and into the future will be a lot greater. But, ‘what legacy?’, you might ask, and why is Turing in my list of Top 5 IT heroes. Wow! From a precocious 13 year old who cycled 60 miles on his first day at school because of the General Strike, to his later research into mathematical biology – the fusion of mathematical modeling and biological processes – and his mysterious premature death aged only 41, Turing was a fascinating and eccentric genius. Turing didn’t single-handedly win the war by cracking the German Enigma Code, but the team he led in Hut 8 in the secret wartime code-breaking unit, and his breakthroughs in cryptanalysis, are estimated to have shortened the most devastating and costly conflict in human history by two to four years. Turing imagined and designed a model for a stored program computer, the so-called Turing Machine, that has influenced almost every computer, tablet and smart ‘phone since, including the work of Von Neumann and the earliest mainframe computers developed in America and England after the war. A bit like his predecessor Charles Babbage, who 100 years earlier had conceived a Difference Engine, based on technology that wasn’t achievable in his lifetime. 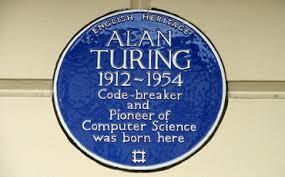 And by the way, Turing is called the Father of Computer Science, developing some of the early concepts in the discipline such as algorithms and computation that are still the bedrock of C21st programming. Following on from the idea of a Turing Machine, came the thought experiment; what makes humans unique, and what would it take for a computer to fool a human into thinking it was corresponding with another human? The Turing Test for Artificial Intelligence was born, and is still used today as a benchmark for thinking machines. Last, but not least, if you turn the Turing Test on its head and try to prove that a computer User is not a machine you end up with Turing Numbers, familiar to anyone who has completed a Captcha form, or similar device to prove that you are who you say you are and not a mischievous or malicious bot (short for ‘robot’). Born in a different time and with a better PR agent, Alan Turing would be esteemed as a colossus, the Galileo, Newton, or Einstein of his time. His film might even have won a BAFTA!